With the end of the Revolutionary War and a renewed sense of normalcy, New York City again looked northward for expansion. James de Lancey Jr. had been banished from New York as a Loyalist and his expansive country estate was confiscated and later sold as building lots. By the 1810s and ‘20s, Grand Street, once a wide drive through de Lancey’s property, was becoming lined with Federal-style homes. The residents of this new neighborhood required schools, shops and churches. In 1826 the handsome Willett Street Methodist Episcopal Church was completed just steps from Grand Street. The undressed schist of the façade had been quarried nearby on Pitt Street. Simple and refined, its perfectly-symmetrical temple-inspired front featured three doors and corresponding openings, each trimmed in contrasting stone. A striking lunette window enhanced the low-pitched pediment. But the city’s desperate need for land and the threat of disease led to the 1851 city ordinance that prohibited any burials south of 86th Street. The trustees of the church, therefore, agreed to move their dead to Cypress Hills Cemetery in Brooklyn. The transfers began in 1854 and continued for two years. What the families of deceased loved ones were unaware of was that the final resting spot was more ornamental than respectful. 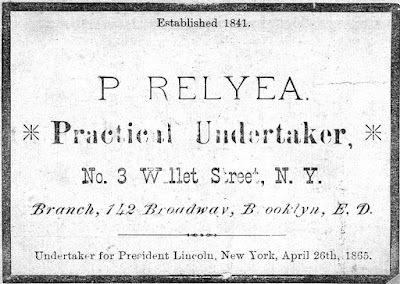 No doubt highly involved in the removals and re-burying of the graveyard denizens were undertakers G. W. Relyea and his son, Peter Relyea. The men lived steps away from the church, at No. 3 Willett Street, and Peter was one of its sextons. The 49-year old Peter Relyea was contacted on April 21, 1865 by the Board of Aldermen and given a nerve-wracking commission. 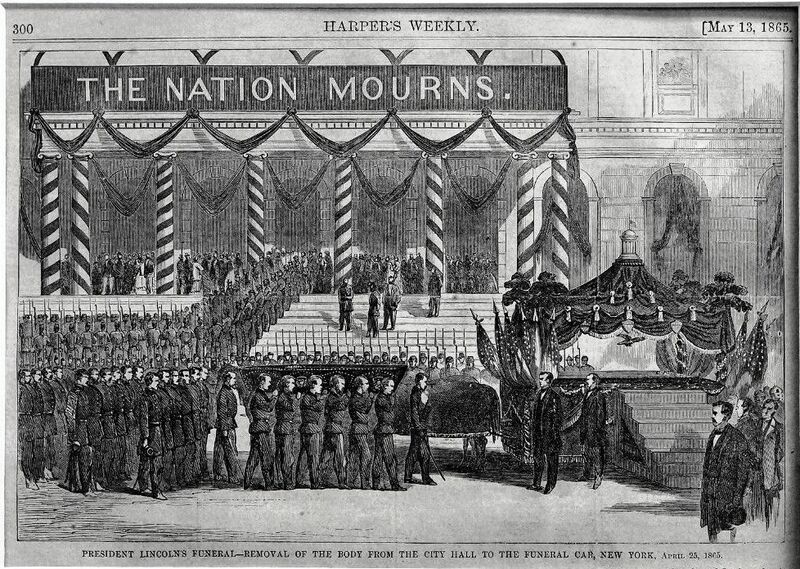 He was put in charge of President Abraham Lincoln’s funeral procession through the streets of Manhattan. He had three days to build the elaborate catafalque that would carry the assassinated President’s remains. Peter Relyea’s hearse for the occasion was so large and so elaborate that it required 16 horses. The immense pressure and the sleepless nights (he told reporters he and 60 employees worked day and night without sleep to design and construct the catafalque) would be worth it. Not only did he receive the staggering sum of $9,000, he would use the honor as a marketing tool for the rest of his career. 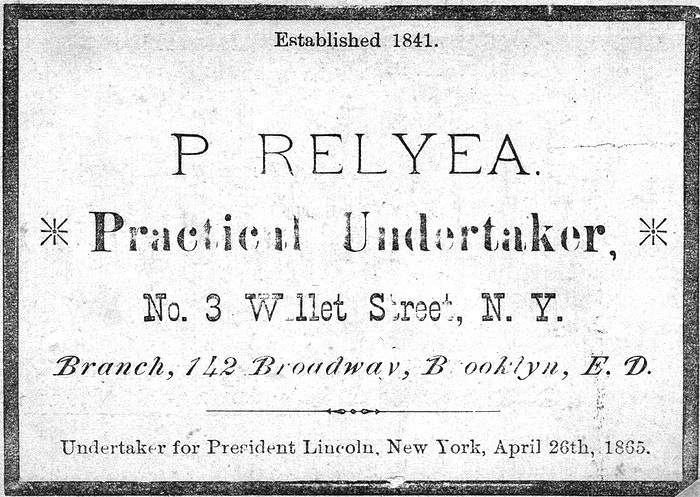 Peter Relyea's business card would forever note "Undertaker for President Lincoln"
Peter Relyea’s life could continue to be far more colorful than that of the average undertaker. He was sued by Margaret E. Bonifice three years later following the elaborate funeral of her father. While he supplied “a certain number of carriages and horses” to transport family and guests from Manhattan to the cemetery and back; a problem ensued on the return. Relyea was back in the news in 1878 when he walked into Police Headquarters and told Inspector Dilks that he knew the identity of one of the grave robbers of millionaire Alexander T. Stewart. The investigator chided Relyea for waiting so long to inform on the criminal. Not intimidated, “Mr. Relyea replied that he had a business to attend to, and that he could not afford to neglect it for the purpose of going about the country playing detective,” reported The New York Times. The minister noted “In the old times the population hereabout was quite different” and he blamed the dwindling membership on a “growing indifference to Christian duty.” In realty, the Grand Street area was changing rapidly. What had been a quiet residential neighborhood was now bustling with commerce. Already a large immigrant population had pushed the former residents northward and tenement buildings were replacing private homes. Peter Relyea was one of the old congregants to surrender to the changes. In 1894 he sold No. 3 Willett Street for $16,000 and moved to Brooklyn. With its congregation dwindling, by the turn of the century, the Willett Street Methodist Episcopal church was in financial trouble. What had been a solely Christian neighborhood was rapidly filling with those of the Jewish faith. On May 19, 1902 The New York Times noted “Once the church had a large congregation, but to-day it has a hard struggle to maintain itself amid the encroaching foreign population.” Pastor J. L. Smith tried a desperate scheme. For the church’s 83rd anniversary, he sent messages to all the old members who had moved away to attend the ceremony. The journal got the spelling wrong, but was otherwise accurate in its reporting. The congregation Chevra Anshei Chesed of Bialystok had been organized in 1865 by a group of Polish immigrants from the town of Bialystok. With their merging with the Congregation Adas Yeshurun (whose members also came from Bialystok), they needed a larger place of worship. But once they were in the new building, near tragedy happened. Captain Joseph McGlynn, in charge of the police reserves that day, ordered the choir to start singing as he headed for the burning drapery. But six-year old Gertrude Rosenblum got there first. The plucky little girl climbed onto a chair and pulled the flaming cloth down, burning her hand in the process. A grown-up stomped out the fire. Little Gertrude Rosenblum tried her best to calm the hysterical mob. “The crowd looked back, saw the little girl swinging the blackened stick in her hand and sat down.” It took 200 additional police to restore order and Captain McGlynn cleared the street each way for a block. What started out in chaos and terror ended with joy. Immediately after the service, Ida Gottlieb and Benjamin Goldberg drove up in a closed carriage. The couple insisted on being the first to be married in the new synagogue. They were greeted with cheers “that took the nerve of the bride, while her husband-to-be turned the color of a Chinese laundry check,” said The Sun. Eventually the stretch of Willett Street was renamed Bialystoker Place. Throughout the 20th century the synagogue survived even as the neighborhood’s Jewish community slowly abandoned the Lower East Side. In 1988 the congregation restored the sanctuary, which is noted for its vibrant and colorful decoration. The nearly 200-year old fieldstone structure survives essentially unchanged since is 1905 change-of-hands--a remarkable relic from a time when the Lower East Side was a new suburb of New York City. A young and ambitious Alfred Miller Hoyt left his native city of Manhattan to study at Kenyon College. There surrounded by the farmlands of Ohio he met Rosina Elizabeth Reese and the pair was married on October 20, 1858 in Lancaster, Ohio. The Midwest appealed to Hoyt and he briefly went into the dry goods business in Ohio, then worked in the lumber regions of Michigan. But eventually he returned to New York where he and his brother formed the commission firm of Jesse Hoyt & Co. By the time the Civil War drew to a close, the brothers had each amassed a fortune. 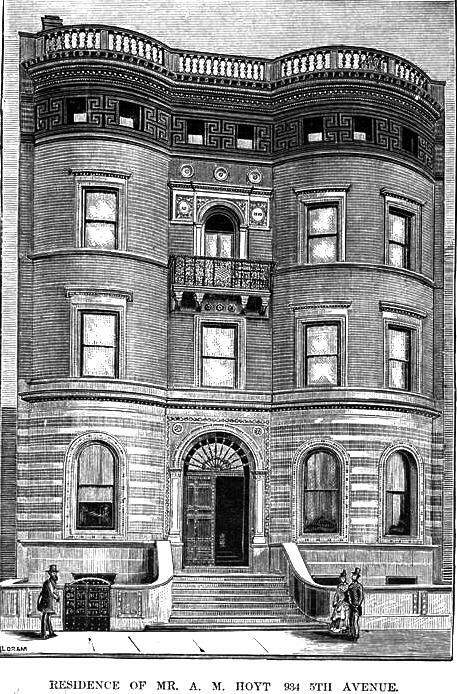 When Alfred retired in 1881 he had established his own banking firm, A. M. Hoyt & Co. and was also a trustees in the Bank for Savings in the City of New York, a trustee in the Continental Trust Company, a director in the Fidelity and Casualty Company, a director in the Merchants’ Exchange National Bank, and a trustee of the New York Produce Exchange Safe Deposit and Storage Company. He also had interest in the Consolidated Ice Company and the Bowling Green Safe Deposit Company. Alfred and Rosalina Hoyt were socially prominent and Alfred held memberships in an exhausting list of the most respected mens' clubs in town—the Metropolitan, the Union League, the Harvard, the University, the Ardsley, the Riding, the Racquet and Tennis, the Grolier, the Seawanhaka-Corinthian Yacht Club, and the Century Association. He was also active in operations of the National Academy of Design, the Metropolitan Museum of Art, the American Geographical Society, and the American Museum of Natural History. Now retired, Hoyt laid plans for a new home along Central Park where New York's millionaires were just beginning to venture. The Hoyts would be among the first of the wealthy families to venture as far north as 75th Street. By the 1890s the migration would be in full swing; but in 1881 the Hoyts’ building site near the corner of 75th Street was still somewhat undeveloped other a few brownstone townhouses erected a decade earlier. Hoyt commissioned the firm of McKim, Mead & White to design his residence.. It was a relatively early commission for the three--Stanford White had just joined the firm in 1879. 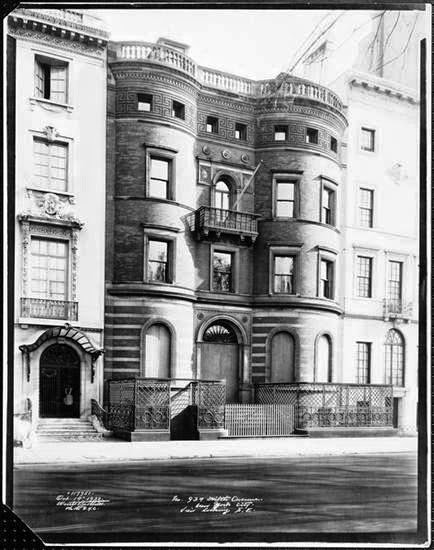 And yet the resultant townhouse smacked of the style of Clarence Fagan True who would be busy filling the Upper West Side with similar structures through the turn of the century. As Beaux Arts and Italian Renaissance palaces clad in limestone or marble crowded around it, the Hoyt mansion looked rather out of place--as though it belonged on the other side of the Park. Built of buff-colored brick, limestone and terra cotta it rose over an English basement guarded by a stone wall with an attractive lacy iron gate. Construction began in 1882 and was completed a year later. The Real Estate Record & Builders' Guide called it "plain but elegant." Like so many of Clarence True’s rowhouses, it featured rounded bays, a central section of brick sitting on a variegated base, a highly-decorative terra cotta top floor, surmounted by a tiara-like balustrade. A Juliette balcony with a waist-high ornamental railing added a touch of Venice. Clever manipulation of the design created the illusion of symmetry at first glance; but a closer view revealed that the southern bay was significantly wider and the doorway slightly offset. When the Hoyts and their servants moved in to No. 934 5th Avenue, at least three of their five children were with them. Alfred W. Hoyt was attending Harvard, his brother John Sherman Hoyt was still a student at Columbia College, and Rosina was still unmarried. The house, as well as their Southampton estate, was the scene of society teas and dinner parties given by Rosina and the Hoyt name appeared in the society pages often. As the turn of the century approached and the 5th Avenue neighborhood filled with costly mansions, the Hoyts remained busy in political as well as social endeavors. Both Alfred and Rosina signed the Woman Suffrage Amendment petition in 1894. In June 1903 Alfred Miller Hoyt was taken ill. A few days later, on June 18, he died in his bed at No. 934 5th Avenue. After the appropriate mourning period, the family reentered the social scene. In January 1908 Rosina gave a dance at the elegant Sherry’s in honor of her granddaughter, Rosina Otis. But mourning crepe would reappear on the door before the decade was out. On November 20, 1911 48-year old bachelor Alfred W. Hoyt—now head of the family banking firm—died in the house after battling typhoid fever for two weeks. Like his father he held multiple directorships including a seat on the board of the Belnord Realty Company that built the Belnord Apartments at 86th Street and Broadway, and the Fidelity and Casualty Company. The two Rosina Hoyts—mother and daughter—remained on in their beloved house catered to by a sizable staff. Young Rosina immersed herself in club activities becoming secretary of the Garden Club of America and hosting the meetings of the Colonial Dames Sewing Class in the house in 1914. By now Alfred and Rosina’s grandchildren were reaching adulthood and a year later the house was the scene of a wedding reception for son Henry’s daughter, Elizabeth Sherman Hoyt, following her marriage to Thomas H. Frothingham of Philadelphia in St. Bartholomew’s Church. Rosina’s buffet lunch was catered by Sherry’s and among the socially-prominent guests included Percy R. Pyne and his family, Mr. and Mrs. George B. Post and daughter, and the John R. Suydam family. The two women lived on in the mansion until February 26, 1922 when Mrs. Rosina M. Hoyt died upstairs in her bedroom. Daughter Rosina received the house, as well as half of her mother’s estate. Mrs. Hoyt expressed her appreciation to her faithful servants in her will. Longtime coachman, Hugh McGuire, received $10,000. Chauffeur Herman Hartmeyer and butler Axel Swenson both received $5,000. And every employee of within the household who had been in service for over three years received $2,000—about $21,500 today. Rosina sold the house to George E. Mitchell, nicknamed “Sunshine Charley” who had been elected president of National City Bank (now Citibank). The millionaire banker demolished Alfred Hoyt’s architecturally-incongruous mansion and commissioned architects Walker & Gillette to design a $500,000 Renaissance-inspired limestone mansion on the site. The mansion exists, complete with Mitchell’s furnishings and artworks, as the Consulate General of France. In 2015 work continues as the three houses are combined into one. The stoop of No. 61 originally rose to what is now a window at far right. Josiah Cleaveland Cady was 47 years old when his architectural firm, J. C. Cady & Co. started work on a string of eight speculative homes in the rapidly developing Upper East Side. Stretching from No. 57 to 71 East 90th Street, between Madison and Park Avenues, they would target affluent families. Completed in 1887, the handsome brownstone-fronted houses were designed in an elegant take on the Romanesque Revival style. Cady forewent the weighty medieval elements of squat pillars, craggy stone and heavy carvings in favor of an undulating façade (the original row was formally symmetrical), planar stone layered with rough-cut bands, and a handsome arcaded parapet. It was not over yet. Two years later she started foreclosure proceedings and on August 17, 1896 The New York Times reported that she had re-purchased the property at $15,399. She finally found a stable buyer in the Theodore Hachert Ward family. Ward, his sons Edward, Frank and Patrick, and his wife Margaret would remain in the house at least until 1903. In the meantime, the other houses along the row became home to well-heeled residents. Hugo Sohmer lived in No. 61. The German-born piano maker had founded Sohmer & Company in 1872 and by 1898 his firm was the leader in marketing player pianos and had produced the first modern baby grand piano. But perhaps the row’s most colorful homeowner was Charlotte King Palmer. Prior to 1910 she was an actress, appearing on stage as Charlotte Catherine Palmer with well-known actors like Lew Fields and De Wolf Hopper. In addition to New York, she acted in London and Paris. She left the stage in 1910 when she married the wealthy James C. Parrish, Jr., described by The New York Times as “former Harvard athlete and a relative of the Vanderbilt family.” The marriage was ill-fated and ended in divorce in 1916. Charlotte King Palmer moved into No. 59 East 90th Street a rich and thoroughly-modern divorcee. In 1920 wealthy women enjoying a night on the town dressed the part. Charlotte left the 90th Street house wearing a sable opera cloak and she dripped with jewelry, including a $300,000 necklace composed of 210 pearls with a large pear-shaped pearl clasp. In her absence, at around 8:30 p.m., three men wearing black made their way into the house. They first surprised Charlotte’s butler, Alfredo Sazone, in his room. After he was bound and gagged, they went to the maid’s room, waking Margaret Creevan and tying her up and blindfolding her. The servants were taken to Charlotte’s bedroom where they were locked in closets. They would remain prisoners in the cramped spaces for nearly 13 hours. Charlotte stepped into the hallway only to find three men standing there. She demanded to know who they were and what they were doing in her house. Charlotte was suspicious and she ran for the stairs. She tripped and tumbled to the landing, briefly losing consciousness. When she came to, one of the men was ripping the pearl necklace from her neck and another plucked the diamond studded hairpins from her hair. When Charlotte began screaming, she was gagged. As the ordeal dragged on, the French-accented thief showed compassion. He told the man standing guard over Charlotte to remove the gag as long as she remained quiet. When she said her back hurt, he had pillows brought to her. Nevertheless, she could hear the burglars ransacking the house. “I realized they were going to rob me of everything I had,” she later said. As morning dawned, the house had become quiet. Charlotte heard noises around 9:00 and her butler entered the bathroom, his hands still tied behind his back. He had managed to force open the closet door, and work the blindfold and gag loose. Charlotte was able to loosen the portiere cord around his wrists, and he then freed her hands and feet. The maid was then released from her closet. Charlotte was unable to walk (it was later discovered she had broken both feet in the fall), so the two servants carried her to the bedroom. They remained there for more than half an hour afraid to move, fearing the burglars were still in the house. Within a week the estimate of the value of the stolen items had risen to $767,000. The well-publicized crime had unexpected ramifications. Charlotte’s maid suffered a nervous breakdown from “the harassment” of detectives. Charlotte received scores of sympathetic letters from well-wishers. “One was from a foreign war veteran who offered marriage and wrote that he had enough for two to live on. He mentioned in passing that he was ‘handsome and affectionate,’ and enclosed his photograph ‘to prove it,’” reported The New York Times. On August 18, 1921 Charlotte leased the house for tree years to musical comedy star Wilda Bennett. The actress agreed on a rent of $1,665. It would end in an ugly court case with the two women trading insults and accusations. Wilda Bennett insisted she received blackmail letters and that to protect her safety and sanity, she was obliged to purchase a police dog and put gratings on a window. And, she said, she was promised the house would be fully furnished with “high class furniture,” and instead she had to spend $2,500 on her own. She counter-sued for that amount as well. On May 13 the judge ruled in Charlotte’s favor and dismissed Bennett’s counter suits. Throughout the remainder of the century Nos. 57 through 61 East 90th Street were each divided into apartments; but their outward appearance remained relatively unchanged, despite Nos. 59 and 61 receiving an unhappy coat of paint. The rest of the row was not so fortunate and became nearly unrecognizable as part of the original group. Then in 2008 a most amazing transaction occurred. Mitchell Blutt purchased all three homes. His intention was to restore the facades and create a single, expansive mansion of 17,000 square feet. Neighbors were outraged as his plan, which included additions to the rear. A hearing of the Landmarks Preservation Commission resulted in changes to the plans and eventual approval. But having received the go ahead, nothing went ahead. In 2009 the homes were offered for sale as a unit at $20 million; or individually. The sweeping split stoop shared by No. 57 and 59 survives. Work finally got under way and in 2015. The paint has been removed from the brownstone as engineers John V. Dinan Associates, Inc. work on creating the massive single private mansion.